Unless you've lived off the grid for the last 60 years, you've heard the "Wilhelm scream." It's a stock sound-bit originally used in film and television post-production. It started in a Western movie. It's back in a Western video game. Kotaku's Owen Good previously wrote about the Wilhelm scream and its long history in the film industry. 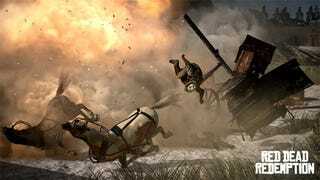 Over 48 notable titles have used the scream but, recently, Red Dead Redemption bridged the gap between the film and video game industries. That scream started in the movie Distant Drum and made its way through all sorts of shows, movies (Star Wars!) and games. It's now in the biggest western of this year, which is, naturally a video game. The scream got its name from the movie The Charge at Feather River. It was exclaimed by the character Pvt. Wilhelm. If a couple of screams wasn't enough for your inner sadist, here's a video of Marvel Ultimate Alliance taking it to the next level with over 50 screams — forwards, backwards, and slowed down for good measure.